Krishna, upon him be peace, is a central spiritual figure of many traditions of Hinduism. He appears in both Bhagavata Purana and Bhagavad Gita. Most probably he appeared in earthly realm about five thousands years ago in Mathura, ancient India. Here is selected excerpts on understanding the personality of Krishna and his wisdom from two enlightened masters, Sufi Inayat Khan and Osho. Sufi Inayat Khan writes: The life of Krishna is an ideal. It gives the picture of the life of a perfect man. The real meaning of the word Krishna is God. The man who was identified with that name was the God-conscious one who fulfilled his message in the period in which he was destined to give it. ... latter part of Krishna's life has two very important aspects. One aspect teaches us that life is a continual battle and the earth is the battlefield where every soul has to struggle, and the one who wants to own the kingdom of the earth must be well acquainted with the law of warfare. In the battle of life man's position is most difficult. He has to fight on two fronts at the same time: one enemy is himself, and the other is before him. The battle of each individual has a different character; it depends upon a man's particular grade of evolution. Therefore every person's battle in life is different, and of a peculiar character. No one in the world is exempt from that battle; only, one is more prepared for it while the other is perhaps ignorant of the law of warfare. And in the success of this battle lies the fulfillment of life. The Bhagavad-Gita, the Song Celestial, from the beginning to end is a teaching on the law of life's warfare. Excerpt only. There is much more what Inayat Khan speaks of Krishna and interprets his life. read the complete article here. Excerpt from “Krishna: The Man and His Philosophy” by Osho: Krishna is so unique. He is not at all serious or sad, not in tears. By and large, the chief characteristic of a religious person has been that he is somber, serious and sad looking – like one vanquished in the battle of life, like a renegade from life. In the long line of such sages it is Krishna alone who comes dancing, singing and laughing. Every religion, upto now, has divided life into two parts, and while they accept one part they deny the other. 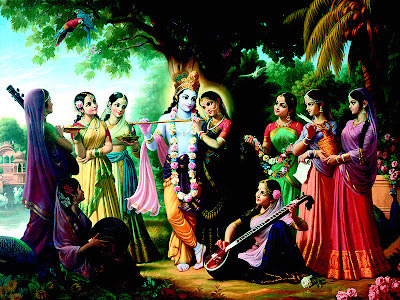 Krishna alone accepts the whole of life. And he accepts it not in any selected dimension but in all its dimensions. About him it is said he was born laughing. Only a joyful and laughing humanity can accept Krishna. Krishna is against repression. He alone does not choose he accepts life unconditionally. He does not shun love; being a man he does not run away from women. As one who has known and experienced God, he alone does not turn his face from war. He is full of love and compassion, and yet he has the courage to accepts and fight a war. His heart is utterly non-violent, yet he plunges into the fire and fury of violence when it becomes unavoidable. He accepts the nectar, and yet he is not afraid of the poison. We describe the life of Krishna as his leela, his play-acting, because Krishna is not serious at all. Krishna’s life accepts no limitations. Krishna is free, limitlessly free. And this freedom, this vastness of Krishna stems from his experience of self-knowledge. It is the ultimate fruit of his enlightenment. There is no such point in the cosmos where nature ends and God begins. It is nature itself that, through a subtle process of dissolution, turns into God, and it is God Himself Who, through a subtle process of manifestation, turns into nature. Nature is manifest God, and God is unmanifest nature. And that is what adwait means, what the principle of One without the other means. We can understand Krishna only if we clearly understand this concept of adwait, that only One is – One without the other. Note: while reading the life of Krishna, time and time again it came to my mind, how parallel and similar is the life of the Last Messenger of God, Muhammad and that of Krishna, upon them be bliss of God. Specially while reading 'Krishna's heart is utterly non-violent, yet he plunges into the fire and fury of violence when it becomes unavoidable.' ... more sharing of that thought God willing in the next post, Krishna and Muhammad.